Almost a million women a year become widows in the U.S.
We never enjoyed that cruise. We didn’t celebrate our special wedding anniversary either. Tom died. Yes, I became a member of the group no woman wants to join — the widows’ club. I was heartbroken. I cried a lot, couldn’t sleep, lost my appetite, was forgetful, felt numb and worried about finances. I wasn’t alone. Almost a million women a year become widows in the U.S.
You have a wonderful opportunity to assist women during one of their most significant life transitions — after a husband’s death. What does a widow want and need from you? That depends partly on the stage of her journey. 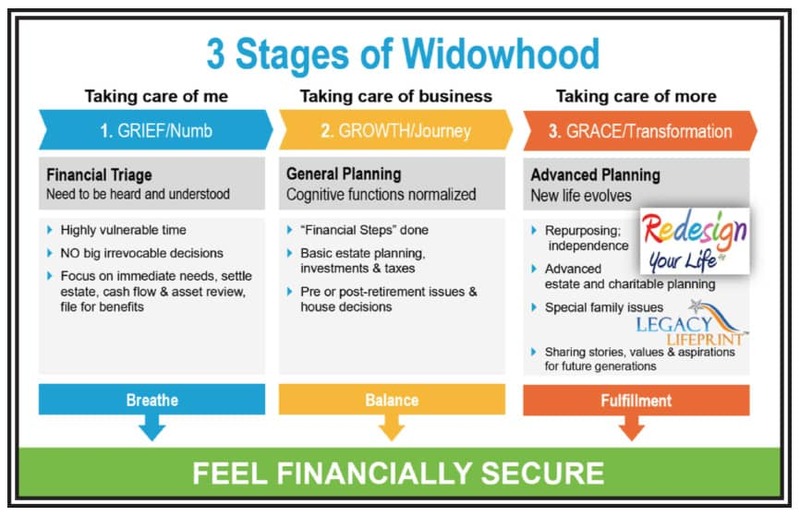 If you understand her passage through the three stages of widowhood, you’ll earn her trust and confidence, and she will gladly refer her widowed friends to you as well. In addition to my own personal 12-year journey, I’ve observed three stages of widowhood with the hundreds of women I have advised over the years. Widowhood is a process that takes time. Each widow moves along her path at her own pace. As you learn to identify the characteristics of each stage, you can offer sound advice to guide her. Early on, a widow is vulnerable and needs to focus on taking care of herself. The emotional stress of a spouse’s death affects her cognitive abilities. As a compassionate advisor, communicate with empathy. Talk about her late husband, using his name. Don’t use clichés such as “I’m so sorry for your loss.” Instead, share a memory of your client’s husband if you can or ask her about the happier times. Say you’re there as a thinking partner on her new journey. Focus on financial triage, encouraging a “decision-free zone.” Susan Bradley of the Financial Transitionist Institute coined this term. Don’t confuse that with a no-decision zone as you concentrate on financial matters needing attention soon. Delay other decisions, such as rebalancing her portfolio, until her thinking normalizes. Create a flowchart, showing money coming in and going out. Make sure bills are paid. File for death benefits from her husband’s former employer if applicable. Be sure health and other insurance policies continue. List various accounts and where they’re located. Check what’s in the safe deposit box. You may help to start the estate settlement process. Do a financial reality check, relieving her of scary homeless scenarios. During this unsettling time, help her feel safe and secure. Encourage your widowed client not to make big irrevocable decisions she could regret later, such as moving from her house too fast. This isn’t the time to invest life insurance proceeds in a new venture she doesn’t understand. Talk about keeping money liquid, for near-term expenses, before making longer-term investments. To help her remember what you have discussed, use this one-page tool. 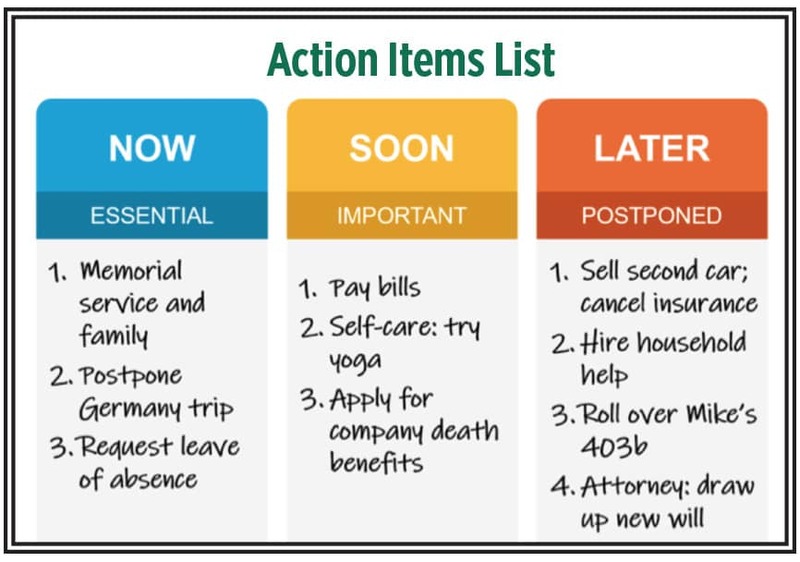 Fold a blank page into thirds, writing the words “Now,” “Soon” and “Later” at the top of each column. She can start to fill it in with a few of the actions you’ve talked about. The yoga term “breathe” fits Stage 1 well. I enjoyed my first yoga class the same day I picked up my husband’s ashes from the mortuary, and I still take classes today. I’ve encouraged other widows to try yoga for their body, mind and spirit. When she’s thinking more clearly, a widow is ready to take care of business in Stage 2. Discuss investments and general financial planning. Plan basic estate updates, examine her financial portfolio for possible repositioning as a single woman and look at her tax situation. 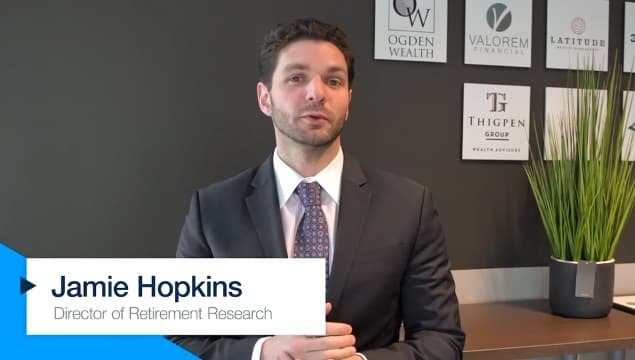 Pre- and post-retirement decisions are important, as are housing decisions. Stage 2 is a time of “balance,” to use another yoga term. I’m often asked how long it takes to move from Stage 1, grief, to Stage 2, growth. That depends on several factors possibly influenced by circumstances of the death. For example, a sudden fatality, such as an accident, is different than an anticipated death, such as a long terminal illness. When death is expected, a widow often starts grieving before her husband dies. The widow whose husband died of a heart attack may linger in Stage 1 longer than someone whose husband died after a long battle with cancer. It’s not a straight linear path from Stage 1 to Stage 2. It’s more like days of two steps forward and one step backward. That’s what it was like for me five months after Tom’s death. I thought, “Yes, I’m making progress.” But then I found a card he gave me years before, signed “I’ll love you forever.” I burst into tears and felt I was losing all forward momentum. I acknowledged my feelings and kept moving forward. Unfortunately, some widows get stuck in Stage 1. They may be elderly women who were enmeshed with their late spouse with little life of their own. These women may die a few years after their partner’s death or even days afterward. This broken heart syndrome is a medical condition, called stress-induced cardiomyopathy. If your client remains stuck, consider recommending grief counseling. Many widows ultimately arrive at Stage 3 of widowhood — grace or, as some say, transformation. It can be a fulfilling time as new life evolves with a renewed sense of purpose. Women enjoy new people, experience and opportunities. Stage 3 is a time of taking care of more. The widow will see herself as an independent woman. She may choose to focus on advanced planning concepts, such as family issues or legacy and charitable planning for those she loves. A business may be involved. It is very rewarding to assist a widow as she moves from heartbreak to breakthrough living. The yoga term “fulfilling” fits here. A widow may welcome a new romantic relationship in her life. I advise widows to be careful about a potential mate looking for a woman to be his purse. In a committed long-term relationship, she’ll want to talk about how money will be handled with her new partner — separate, blended or both. Your skills will help her navigate money conversations. A prenuptial conversation is appropriate for those who are marriage-minded. Your widowed client has loved. She has lost her husband and her former lifestyle with him. But she can move forward into a transformed life that includes new passion and purpose. With your help, she’ll move forward on her own but not alone. Kathleen M. Rehl, Ph.D., CFP, CeFT, is author of Moving Forward On Your Own: A Financial Guidebook For Widows. Kathleen may be contacted at kathleen.rehl@innfeedback.com.